Hey everyone! Travis here with more of what we know you LOVE...that&apos;s right, TICKET GIVEAWAYS!!!!! This week we are giving away tickets to RESPECT: A Musical Journey of Women. We will be doing a 2-pack of tickets each and every day this week, so keep an eye out! The tickets are for opening night of the show, this Friday, June 19!!!!! So, you can make a night out of it! From "Someone To Watch Over Me" to "I Will Survive." 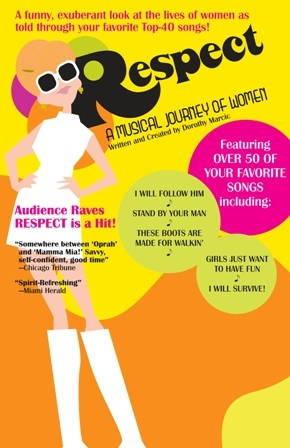 It&apos;s the journey of women, told through Top-40 music in the new musical production RESPECT: A Musical Journey of Women. From the codependence of "I Will Follow Him" to the anger of "These Boots Are Made for Walking," to the cynicism of "What&apos;s Love Got To Do With It," and finally to the strength of "Hero." Combining excerpts of 60 songs with women&apos;s own stories about finding dreams, lost love, relationship issues, entering the workforce, gaining independence, and more, this show is "exhilarating!" It&apos;s more than just a story worth telling, it&apos;s a must-see and must-hear. For more than the first half of the last century, the voice of women in Top-40 popular music has been one of neediness and dependency. I&apos;ll do anything for you; just be my baby, even if you&apos;re no good and treat me bad; just LOVE me and I&apos;ll stand by my man. By the end of the century, things were quite different. Popular music had come far enough so that women looked for the hero within themselves, were urged to get on their feet and make it happen, ready to stand on her own with or without a man. Messages encompassed "I am woman-hear me roar," to "I will survive" and encouraged women to find their own dreams. Vanderbilt professor Dr. Dorothy Marcic created the show based on her book, RESPECT: Women and Popular Music, where she analyzed all Top-40 female song lyrics since 1900. Recent feedback from audience members includes: "Your show is one of the best things I have ever seen, period." -Shawn Johnson, Kansas City. "This was one of the most inspiring performances I have attended in my life. "-Vladimir Brajkovic, Melbourne, Australia; "It was the musical history of MY life," Sheri Bewitt, Orlando. There&apos;s the description...and how could you not want to go? AND, let&apos;s review the rules, so you don&apos;t miss out...1 - You have to be follwing us on Twitter.com (www.VisitTampaBay.com/Twitter); 2- Answer one question about RESPECT: A Musical Journey of Women; 3 - You have to re-tweet the original tweet in order to be eligible to win (a lot of people forget this one, so make sure you re-tweet); and 4 - You have to answer the question and be the first to do so. And there you go. So, keep an eye out for the questions. And, keep checking back for more great things to do in Tampa Bay, plus some great ideas for shopping in Tampa Bay. It is the summer after all!